The media scene and the consuming habits of contents have been in constant evolution through the years. With the appearance of blogs and social media citizen journalism was born, as well as a democratization of information. Then, news organizations began to realise (late) that rules were changing. Soon after, the rise of smartphones changed the paradigm again. The so-called multi-screen content consumption appeared, as well as a new social reality to which, nowadays, some of the media companies are finding it hard to understand and adapt. After the Facebook F8 Developer Conference, the last 12th of April, one of the greatest novelties has been the arrival of chatbots to Messenger, the Facebook messaging application. What are chatbots and what do they enable media to? A chatbot is an interactive artificial intelligence software designed to simulate human conversation. 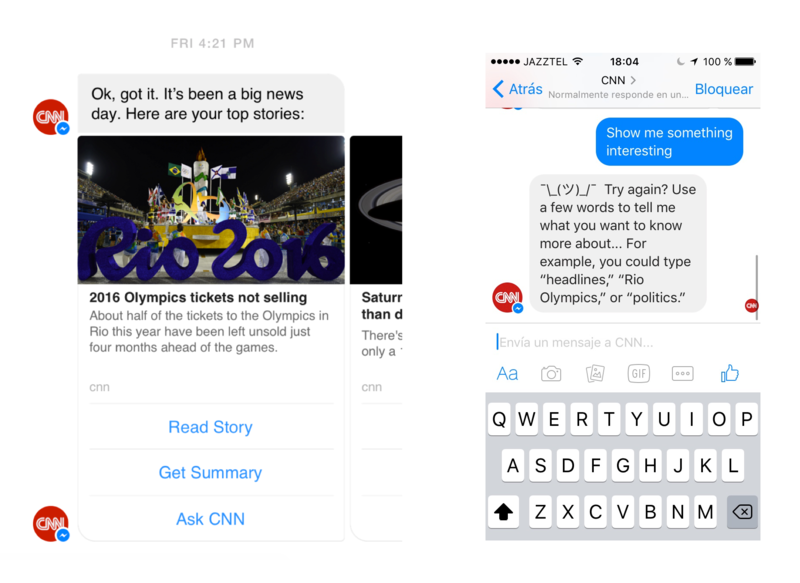 Publishers and companies can now build their own bots on Messenger for their users to interact with them, make an order or read the news. Though until now chatbots have been used mainly for performing customer assistance functions, these have popped up again to help users with practically everything: from booking a taxi to managing your meetings or booking a plane ticket. They have been designed to be a natural way of interacting with companies in the same way we chat with our friends. Chatbots will allow a more personalised connection with users, which means publishers will gain better knowledge of them, their behaviour and interests. Facebook is now part of our identity, therefore thanks to the generated conversations through its messaging platform, the media industry will be able to compile (even more) data and understand better who their readers are and what they want. On the other hand, as well as Instant Articles offered the media the possibility of monetising their contents, Facebook also wants to take advantage of this new tool to insert advertising, as TechCrunch informed. During the last weeks, many focuses of opinion and interest have been taking place around bots by part of developers, analysts and investors. Everything points out that chatbots could be the next big thing and one of the most significant events for the technology industry, just as it happened with the app stores. However, certain answers and solutions seem to still be up in the air. One of the big questions that stirs up more interest is whether the experiences with chatbots would be superior to those involving the native mobile apps. With antecedents like Siri (iOS), Google Now (Android) or Cortana (Microsoft), the bots are already being used by messaging applications like Kik or Slack, and they have been described as the future of applications by the CEO of Microsoft, Satya Nadella. Opposing the euphoria in relation to chatbots, other less optimistic voices have been raised. Bot development is yet too new and it seems that it is still necessary to improve and refine the AI development so as to achieve better experiences. At this moment, the bot only understands those keywords it provides. There is no full understanding in conversation, which makes the experience of talking to it more similar to navigating through an option menu rather than having a regular message exchange. The biggest challenge is creating bots that are attractive and useful enough for users to maintain a natural and fluent conversation with them. Other of the questions being considered is the lack of demand by users. Despite the efforts of the big technology companies, there are yet doubts about the fact that bots could be actually a priority for consumers and that its success could be assured. In addition, it has been argued that users who do not have Facebook Messenger would have to install the platform and add the bot, which implies the same problem apps have today. There is no doubt that, concerning the rise of chatbots, Facebook’s messaging app could become the new channel in what respects to content distribution. In fact, many mass media companies like CNN have already started to use these AI services through the platform. For the media industry, which seeks to widen its audience, Facebook has become a powerful ally lately. Besides, in light of this kind of initiatives, as it already happened with Instant Articles, several publishers fear losing importance by the distribution of stories out of their platforms. In that sense, Julia Greenberg presents an interesting reflection in Wired about the control Facebook exercises over the media industry. It is undeniable the huge power the social network has to change the rules of the game, as well as its control over the media; but it would not be very clever being out of these platforms if journalists want their readers to keep reading their articles. With more than 1.5 billion users, Facebook has a larger scope than any other medium in history. The former executive at NBC, The New York Times and Twitter, Vivian Schiller, admitted in a statement to The New York Times that publishers had little choice but to cooperate with Facebook as it was “too massive to ignore”. And being there implies, among other risks, losing control over content distribution. It is still early to predict what the future of bots will be, and it’s not entirely clear to what extent it will affect media; but what we know for sure is that they will change, once again, the way in which we interact with news organizations. The advantage of being in these new platforms is that media can explore and identify behaviours depending on the user experience, as well as learn and conquer new formats and languages for its informative use. Journalists will have to adapt or reinvent their products to these new environments and use the innovation to transmit information better than before. Beyond looking for magic formulas, it is important taking into account how readers consume their contents and understanding their behaviour. If eventually Facebook Messenger bots prevail as a new communication tool, the media will have a new way of communicating with its audience and the possibility to explore a different world so as to offer their readers a better experience. The success of chatbots will depend, to a large extent, upon how they are developed, but also upon users’ reaction and interaction with them. As mentioned above, chatbots are already being adopted, or at least being tested, by some of the big-name media companies. However, for those small publishers that have fewer resources available it is not easy to develop their own conversational interfaces. Bots hold potential to be something interesting, but looks like they still have a long way to be adopted by the masses. WordPress administrators should not expect a new version of the CMS including a chatbot among its features. This won’t happen in the near future. But we all know that WordPress core features are just the starting point. WordPress strength relies in the Plugin Directory, with thousands of free plugins extending the basic features. 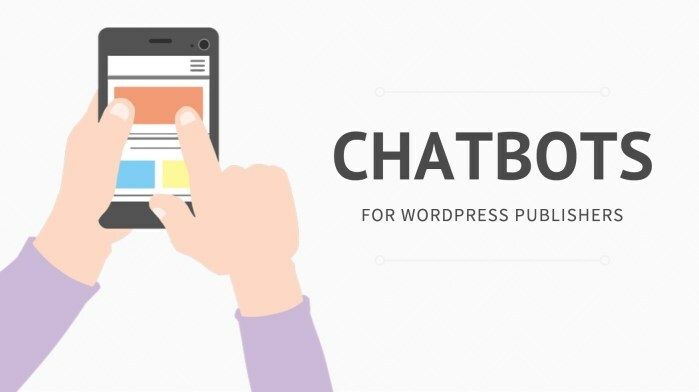 The Plugin Directory doesn’t have any chatbot plugins yet, but they will certainly appear if the AI software becomes a must-have for content distribution.